PC shortcut keys for special characters. Linux and Unix shortcut keys. F1 - F12 function keys. Shortcut keys help provide an easier and quicker method of navigating and executing commands in computer software. Shortcut keys are commonly accessed by using the Alt key (on IBM compatible computers), Command key (on Apple computers), Ctrl key, or Shift key in conjunction with another key. The de facto standard for listing a shortcut is listing the modifier key, a plus symbol, and another key. In other words, "Ctrl+S" is telling you to press and hold the Ctrl key, and then press the S key too. You can also find the shortcut keys in popular programs by looking for underlined letters in their menus. For example, the image to the right has an underline on the "F" in File, which means you can press the Alt key and then the "F" key to access the File menu. Some programs require the user to press and hold Alt to see the underlined characters. In the image above, you can see that some of the common features, such as Open (Ctrl+O) and Save (Ctrl+S), have shortcut keys assigned to them. As you begin to memorize shortcut keys, you'll notice that many applications share them. 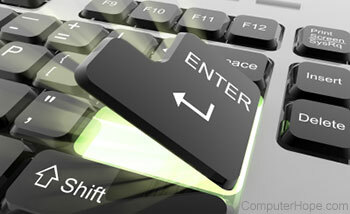 We have a list of the most commonly shared ones in the basic PC shortcut keys section. Tip: Users outside the United States or who have a non-US copy of Microsoft Windows or a Microsoft application may not be able to use all the shortcut keys listed below. Below is a list of some of the most commonly used basic shortcut keys that work with IBM compatible computers and software. It is highly recommended that all users keep a reference to these shortcut keys or try to memorize them. Doing so will dramatically increase your productivity. Tip: Besides the special character shortcuts listed here, some are also located on the number keys (below the F1 - F12 keys). You can enter these special characters by pressing the Shift key and the number key that has the special character listed on it. Alt+E Edit options in current program. Alt+Tab Switch between open programs. F1 View help information (F1 is used by almost every Windows program to display help). F2 Rename a selected file. F5 Refresh the current program window. Ctrl+N Create a new or blank document in some software, or open a new tab in most Internet browsers. Ctrl+O Open a file in the current software. Ctrl+B Change selected text to be bold. Ctrl+I Change selected text to be in italics. Ctrl+U Change selected text to be underlined. Ctrl+K Insert hyperlink for selected text. Ctrl+Esc Opens the Start menu. Ctrl+Shift+Esc Opens Windows Task Manager. Alt+F4 Close the currently active program. Alt+Enter Open the properties for the selected item (file, folder, shortcut, etc. ).